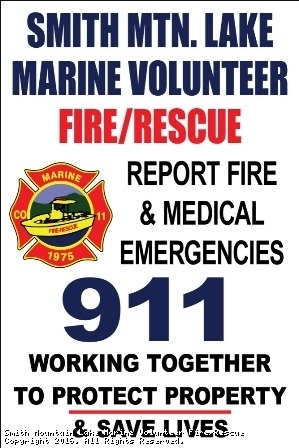 Welcome to the Smith Mountain Lake Marine Volunteer Fire Rescue Department's website. Our Mission is to provide the highest level of emergency service possible, treating all people with compassion, dignity, respect and tolerance. Services include, but are not limited to, fire prevention and suppression, emergency medical service, and water safety activities. We serve residents and visitors alike, on and around Smith Mountain Lake in Bedford, Franklin and Pittsylvania Counties. Serving the Smith Mountain Lake community since 1975, dedicated volunteers respond to emergency calls for service year-round. With a fleet of eight specially designed and equipped fireboats strategically located, the department responds to all fire, rescue and medical emergency requests on the 20,600 acre lake and within a thousand feet of the lake's 540 miles of shoreline. We are an all-volunteer organization and are always looking for new members. If you would like to volunteer, check out our Recruitment information block on this page. As an all-volunteer organization we rely on the community for financial support. If you would like to donate, check out the Donate tab on this page. 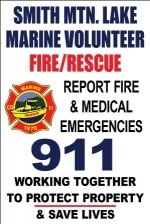 Smith Mountain Lake Marine Volunteer Fire Rescue maintains an Insurance Service Office (ISO) rating of 6. Check with your homeowner’s insurance provider to insure you are taking advantage of all discounts available from an ISO 6 rating. 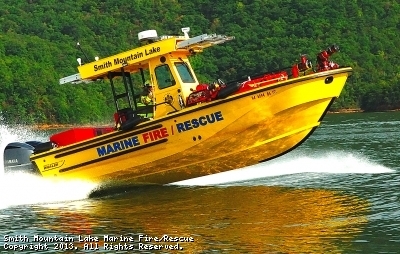 The Smith Mountain Lake Marine Fire/Rescue is actively seeking new members. Members can be firefighters, EMT's or simply someone that wants to help the community. If you feel that you have that calling to help others, that is the person we would like to speak with. Please drop us a note on this page or submit an application at Bedford County Department of Fire and Rescue. Remember, "MANY HANDS, MAKE LIGHT WORK"! This site has been viewed 122,385 times.